Potential benefits of palm oil come at the expense of Indonesia’s natural forests. Indonesia - BOGOR, Indonesia (8 July, 2013) – High demand for edible palm oil in India, China and at home has made Indonesia the top global producer of crude palm oil, according to statistics compiled by scientists at the Center for International Forestry Research (CIFOR). The Indonesian government is responding to this by implementing the Indonesian ISPO scheme, which becomes mandatory for all oil palm companies in the country by end of 2014. Antara News. 2012 RI`s CPO production in 2012 projected at 25 million tons. 4 January. Bahroeny, J.J. 2009 Palm oil as an economic pillar of Indonesia. Jakarta Post, 2, December. Boucher, D., Elias, P., Lininger, K., May-Tobin, C., Roquemore, S. and Saxon, E. 2011 The root of the problem: what’s driving tropical deforestation today? Union of Concerned Scientists (UCS), Cambridge, USA. 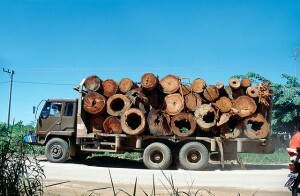 Bruntse-Dahl, R. 2011 Malaysia and Indonesia bolster defense of palm oil industry to West. The Guardian, 20 May. Casson, A., Tacconi, L. and Deddy, K. 2007 Strategies to reduce carbon emissions from the oil palm sector in Indonesia. CIFOR Working Paper 62. CIFOR, Bogor, Indonesia. Colchester, M. 2010 Land acquisition, human rights violations and indigenous peoples on the palm oil frontier. Forest Peoples Programme, London. Colchester, M. and Chao, S. 2011 Oil palm expansion in South East Asia: trends and implications for local communities and indigenous peoples. Forest Peoples Programme, London. Fitzherbert, E.B., Struebig, M.J., Morel, A., Danielsen, F., Brühl, C.A., Donald, P.F. and Phalan, B. 2008 How will oil palm expansion affect biodiversity? Trends in Ecology and Evolution 23(10): 538–545. Gibbs, H.K., Ruesch, A.S., Achard, F., Clayton, M.K., Holmgren, P., Ramankutty, N. and Foley, J.A. 2010 Tropical forests were the primary sources of new agricultural land in the 1980s and 1990s. In: Proceedings of the National Academy of Sciences of the United States of America, 16732–16737. International Finance Corporation (IFC) 2011 The World Bank Group framework and IFC strategy for engagement in the palm oil sector. IFC and the World Bank, Washington, DC. Jelsma, I., Giller, K. and Fairhurst, T. 2009 Smallholder oil palm production systems in Indonesia: lessons from the NESP Ophir project. Report by the Plant Sciences Group, Wageningen. Wageningen University, The Netherlands. Marti, S. 2008 Losing ground: the human rights impacts of oil palm plantation expansion in Indonesia. Friend of the Earth, Life Mosaic and Sawit Watch, London. McCarthy, J.F., Gillespie, P. and Zen, Z. 2011 Swimming upstream: local Indonesian production networks. World Development 40(3): 555–569. Miettinen, J., Shi, C. and Liew, S.C. 2011 Deforestation rates in insular Southeast Asia between 2000 and 2010. Global Change Biology 17: 2261–2270. Pahan, I. 2010 Kelapa Sawit : Manajemen Agribisnis dari Hulu hingga Hilir. Penebar Swadaya, Jakarta, Indonesia. Pardamean, M. 2011 Sukses Membuka Kebun dan Pabrik Kelapa Sawit. Penebar Swadaya, Jakarta, Indonesia. Potter, L. 2008 Dayak resistance to oil palm plantation in West Kalimantan, Indonesia. Paper to the 17th biennial conference of the Asian Studies Association of Australia, Melbourne, 1-3 July. Sheil, D., Casson, A., Meijaard, E., van Nordwijk, M., Gaskell, J., Sunderland-Groves, J., Wertz, K. and Kanninen, M. 2009 The impacts and opportunities of oil palm in Southeast Asia: what do we know and what do we need to know? CIFOR Occasional Paper 51. CIFOR, Bogor, Indonesia. Slette, J.P. and Wiyono, I.E. 2011 Oilseeds and products update 2011 USDA Foreign Agriculture Service, Jakarta, Indonesia. World Bank 2010 Environmental, economic and social impacts of oil palm in Indonesia: a synthesis of opportunities and challenges. World Bank, Jakarta, Indonesia. World Growth 2011 The economic benefit of palm oil to Indonesia. World Growth, Arlington, USA. This research was carried out as part of the CGIAR Research Program on Forests, Trees and Agroforestry. New round of pulp and paper expansion in Indonesia: What do we know and what do we need to know?